A compelling illustration of how through the cross, Christ took the "blame" for all of our sin, and credits us with his righteousness. Has someone ever received credit for something you did right? Did that bother you? Have you ever been blamed for something wrong someone else did? Did that irritate you? Look at “Our Record of Wrongs.” We’ve all done things that have offended others—our family, friends, co-workers. Those wrongs also offend God. In his book, the Bible, God calls those wrongs “sins” and tells us that “all have sinned” (Romans 3:23). Deep down inside we know it. God also tells us “the wages of sin is [eternal] death” (Romans 6:23). We’re all in the same boat. Now, look at “Christ’s Record of Righteousness.” The record of God’s unique Son, Jesus Christ, is absolute righteousness. The Bible says Jesus was “without sin” (Hebrews 4:15). 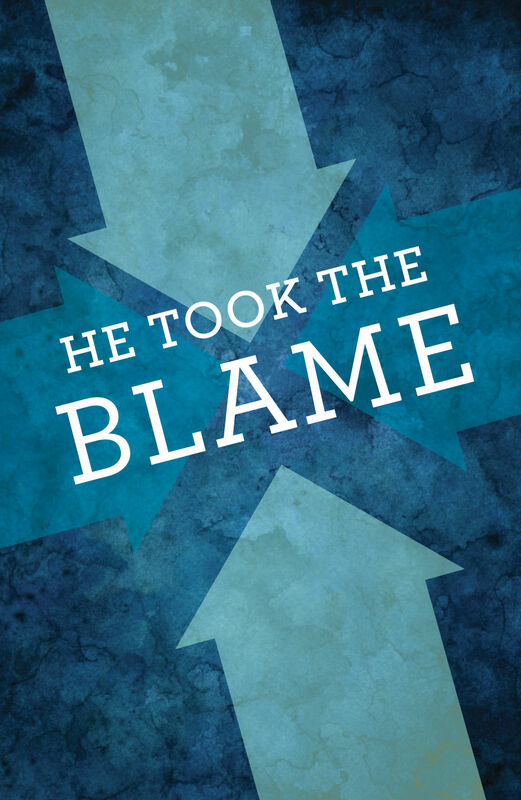 That “Blame” arrow shows how God took all the sins on our record and transferred them to the account of Jesus Christ. Jesus took the blame for what we did, and suffered and died for our sins! The Bible says that Jesus “suffered once for sins, the righteous [one] for the unrighteous [all of us], that he might bring us to God….while we were yet sinners, Christ died for us” (I Peter 3:18, Romans 5:8). Christ’s death on a cross for our sins is a fact of history. Three days later Christ came back to life (proving God had accepted his full payment of our sin debt), and was seen by hundreds of people (1 Corinthians 15:1-6). Notice the “Credit” arrow. God offers to take all the righteousness of Christ and transfer it to our account so that we get credit for what Christ did—as if we actually had done it ourselves! God says in the Bible that “the righteousness of God…[is] upon all them that believe” (Romans 3:22). By trusting in what Christ did as your substitute, you can be assured of a new life right now and a home in heaven with God—and Christian friends and relatives—when you die. Let’s look at it this way…if you agreed to allow me to deposit one million dollars in your bank account, even though you didn’t earn a penny of it, you’d immediately become a millionaire, wouldn’t you? If you agree with God about your spiritual bankruptcy and accept his offer to forgive your debt of sin and to deposit Christ’s righteousness in your spiritual account, then your debt will be cleared! You’ll be made right with God, and be assured of heaven…all because of what Christ did for you! And if you refuse to accept all that Christ has done for you…who’s to blame? Some people seem to think they get “points” for each religious act and good deed they do. They believe that they’ll do enough “good” to get into heaven and offset the “bad” they’ve done. That’s like a confessed murderer trying to convince a judge that he has done so many good things that he deserves to get off unpunished! God’s justice demands absolute righteousness. If anything less would have been enough, Christ would not have had to die! Why don’t you quit trying to build up enough points to get into heaven? You and I could never be absolutely righteous, for we are already lacking…we’re already sinners! The Bible says, “Not by works of righteousness which we have done, but according to his mercy he saved us…through Jesus Christ our Savior” (Titus 3:5-6). Jesus himself died for our sins to provide the righteousness we need to please God. Many people today believe that Jesus Christ exists and that he is powerful, but they’ve never received him as their own Savior from sins. Will you put your trust in all that Christ did for you, expecting Him, as the Son of God, to save you right now? The offer of the Bible holds true: “As many as received him [as Savior], to them gave he power to become the sons of God, even to them that believe on his name” (John 1:12). Jesus promised, “Him that cometh to Me I will in no wise cast out” (John 6:37). Come to him right now and pray something like this: Dear God, I’m sorry for all I’ve done wrong. I believe you that Christ took the blame for my sins and died for me. I accept him as my Savior right now. Please credit my account with his righteousness. Thank you, because you promised to save me when I trust in what Jesus has done for me.